Though he died several decades ago many CAC members still pray with his name. Whenever they pray they add Olorun Joseph Ayo Babalola. That is how much he is reverred by CAC adherents. This is one of the things that got us curious in City People about the Life and Times of this great man of God this is because late Apostle Ayo Babalola is one of the greatest men of God that ever tread the face of this earth. He is the founder of Christ Apostolic Church (CAC). He was born on the 25th of April 1904 at Odo-Owa,Ilofa, in present day Ekiti Local Government areas of Kwara State, Nigeria to the family of late Pa David Lawani Rotimi and Madam Martha Talabi Rotimi. His father was a devout Christian and was also the founded CMS church at Ilofa/Odo-Owa, the Church was in sixteen other towns then. 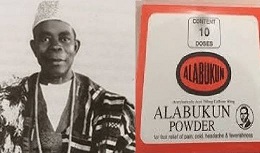 Babalola was brought up as an Anglican. He was brought to Lagos by his Uncle Mr. M.O. Rotimi who was a teacher at C.M.S. he went to elementary school at Oto-Awori near Badagry before he went to Methodist school at ago ijaye in ebute meta Lagos for just 2 years before he was enroll again at All saint M.C.S school in Osogbo, Osun State were he study to Nigeria Reader IV (primary 4) were he stop his education to learn Blacksmith for two years. He also learn Roller Driver under P W D (Public Works Department), he became a Steamroller Operator then under the control of the whites, learning to become a Steamroller Driver. After 15 days of learning how to drive the caterpillar, he was able to drive it without any assistance. After nine months; he became a master in his class. He became the prophet of God in 1928 when God called him. It was while he was working as steamroller along Akure – Ilesha road in October 9th 1928 about 12.00 noon by the river Ariran that he heard a loud voice from above like the roar of thunder which called his name thrice saying “Joseph! Joseph!! Joseph!!! Leave this job you are doing; if not, this year you are going to be cut off from the earth.” Again On 11 October 1928, while trying to repair his machine, he heard an audible voice from the Lord to abandon the job and start preaching. That is how he received the call and he went into fasting and prayer. In this Special Report, City People ONDO/EKITI Reporter, ADEOLA SHITTU tells you some hard Facts and predictions of the founder of C.A.C, Apostle Joseph Ayo Babalola. His first encounter with God after hearing his voice, was when the angel of the Lord told him to enter his house the voice called to him again telling him to fast for six days and pray 120 times which he faithfully did as he slept that night, an angel entered into his room like lightning and began to talk to him. Then the angel told him to put off the light inside the room which he immediately did. Thereafter a brighter light completely different from any other lighted the whole room. The angel told him not to taste any manner of food for six days that the Lord Jesus Christ wants to send him some important works to various towns. The angel told him that he was the one who had been talking to him on the road when he was driving and that he would have died if he had refused to hearken to his instructions. That is how he received the call and he went into series of fasting and prayer, all the while he was in Ipetu-Ijesha in Oriade local government area of Osun State. During this period of fasting and prayers , he received lots of revelations which formed the basis of the way he operated in his ministry. He later joined the Faith Tabernacle Church in November 1929 where he was baptized in Lagos lagoon in December the same year. Following the voice of the Lord that Apostle Babalola heard in 1928, his first miracle was when the revival of his mission began with the raising of a dead child in September 1930. What followed this in three weeks was the healing of about 100 lepers, 60 blind people and 50 lame persons. This also resulted in the desolation of Churches in Ilesa because their members transferred their allegiance to the revivalist and that all the patients in Wesley Hospital, Ilesa, abandoned their beds to seek healing from Babalola. This divinely kicked off The Great Revival of 1930, which saw people coming from most parts of Africa and diaspora without posters and TV adverts. Apostle Joseph Ayo Babalola ministries were given Bell (Agogo), Omi (water), Staff and his Bible. According to him the use of Bell (Agogo) is said to be used to call Angels of God down during a prayer gathering. While the water is said to be used for healing of all illness and disease and it opening the womb of any barren women. He had toured Yoruba land and eastern Nigeria, preaching about repentance, and renunciation of idolatry, the importance of prayer and fasting, and the power of God to heal sickness. And although his tour he have with him, his bell and Yoruba Bible in hand. During this period he also visited many towns and villages based on the Lords guidance where he preached the message of healing and deliverance to the people. He was specifically instructed by God to heal the sick through water which he prayed into. However for a period of six months he still maintained a strict regime of prayer and fasting. The watershed in his early ministry came when he was commanded by God to go to his hometown to warn his people against Idolatry, fetish practices and evil works. According to him The Spirit told me to go to my hometown, where I was born. The Lord said I should rub my face with ashes and to carry palm leaves in my hand and to buy a bell, which I was to be ringing the moment I entered the town and I obeyed. The voice told me to tell my people that unless they repented, evil beasts would enter the town to destroy them. On that same day I entered the town with a bell in my hand. The entire town was moved and there was great stir and consternation as people fled as they saw him. The moment they set eyes on me they fled. The Voice told me to ring the bell in my hand round the town and I obeyed. His people however refused to repent or change their ways they instead summarily beat him up and his family was subjected to heavy persecution by the people of the town. In defense against the prophesied invasion of the town by wild beasts the people of the town armed themselves with Guns and Cutlasses. However God told His Servant to tell them he would not bring beasts again but instead would bring epidemics and it would start within forty- five days. At the expiration of the prophesied forty-five days and epidemic of small pox broke out and within 3 weeks about 300 persons had died. But those who repented and those who came to the man of god after contracting the disease were spared. Another fact about him is that, Apostle Babalola will prayer for days unstop. According to some of his disciple that said, on several occasion as the God Apostle prayer to God on broken glass. He also sometime stand for 7 days praying to God unstop. Another interesting scenario of his prayer style is that Babalola’s shortest and brief prayer was that of 3 to 4 hours. It was remarked by Elder Abraham Owoyemi of Odo-Owa that the prophet regularly saw angels who delivered divine messages to him. An angel appeared in one of his prayers and forbade him to wear caps. The parable of the 3 Palm tree leaves that God gave to Apostle Babalola on the believers and the church of God. One of the palm tree was dry (Ogbe), the other palm tree was rusted ( Oro) while the last one was fresh (O tutu), the dry palm tree are for those who refuse to accepted him as there God will dry of fat the end. While those who deceitful accept him as there savior with rust away. Why those who accepted him God as there personal saviour shall be fresh forever and ever. It was said that the palm tree leafs which God use as a parable for him, was the leafs he use to protect his steamroller when it breakdown. After some weeks that apostle went back to the truck, of the three leafs was Dry, the second was rust while the third one was very fresh. Babalola during his life time, was the one that prophecy and save the life of Lady/ Evang. (Dr.) Bola Are, who is today known all over the world. The water Babalola use to bath Mama Bola Are then was taking from Ile-Oluji, the present place where they cited Christ Apostolic Church, Oke Isegun, DCC headquarters. Another fact is the power in the Ikeji Arakeji water in Osun state, the water over the years have heal many people. Finders reveal that the water has no end or begin and it has never gone since 1928. He is one prophet that believes in power of prayer, it was said that, he made African to believe that they can pray directly to God and get answers without any sacrifice or worshipping idols. Prayer is one of his hobbies and in any town he found himself, he look for a wildness or mountain to prayer. This was how he moved to the mountain which he named Ori Oke Anu (Mountain of Mercy), after a while, he established a CAC church on it and his building is still their till date. The Mysterious Tree of Usi Ekiti: This was a tree in a Forest believed to be inhabited by evil spirits and it was in this forest a land was given to him for his revival campaign. This tree had been cut many times but it stood again as if nothing had been done to it, however the Apostle went to the tree rang his bell and prayed on the tree and it was cut down forever. Another mysteries encounter of late Apostle Babalola was the one he had with gods of Ifira, this god called “egule” worshipped in the Isowo Quarters of the town. This god was so ruthless that no man dares point a finger at it to call attention to it as such acts led to forfeiture offenders or death. It is said that a big python coiled around the pot on which the god was placed. This god was situated on a bushy hill and no one dares goes there for fear of being harmed by the god or the python guarding it. When the Apostle got to this town he requested to visit the hill of this god. People were concerned for his safety but he insisted, then people from neighbouring towns and villages came to see what was going to happen. All he took was his bell and his staff and he went to the hill with people watching him. Immediately he cited this god and its python he started ringing his bell as he moved towards it. And immediately the pot on which the god stood broke into pieces and the god hen the snake fled, when people saw this they started singing and rejoicing and the people beheld the Python and trampled it till it died and the people abandoned the Idols for God.